These are the four basic types of multiple sclerosis. You can either read about each one by following the links, or scroll down to read below before leaving this page. These four categories deal with the course that MS will follow during a persons lifetime. 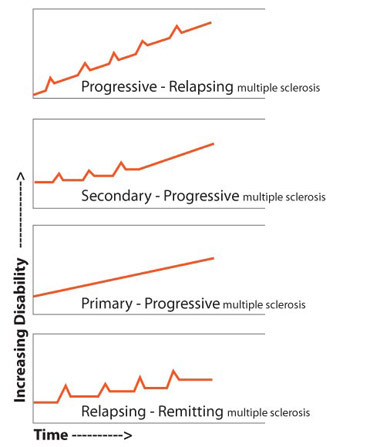 Within each of these four types of multiple sclerosis, there are varying degrees of severity. Even with that said, no two MS patients will ever be exactly the same. Cir and I have met people in each one of these categories. Some of them you could never tell by looking at them that they have MS. They don't use canes or other mobility aides. They walk around. They work. For this reason, MS is sometimes described as being an invisible disease. We've also met people on the other side of the coin. Some use a cane or wear an afo. 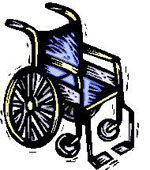 Others are in wheelchairs (manual or electric) and some use walkers or rollaters. We've even met some who could not move on their own. They still all had one thing in common – one of the four types of multiple sclerosis. There are several other ways of classifying the disease besides the four types of MS. These terms don't refer to the course that MS follows. They refer more to the severity or timing of MS. Follow the links to find out more about each of them. No matter what type of MS you have, when you were diagnosed, or how severe it is, don't feel that life is over. Cir has had some pretty scary times. I've watched him go from an active, independent adult to having to sometimes depend on someone to help him get dressed. Through it all he's always managed to go on. When we were married, I believed Cir was the strongest man I knew. I believe he still is, and now even more. Anyone who can live with the uncertainties of multiple sclerosis and still get up every morning, is very strong in my book. Whichever type of multiple sclerosis you have, rrms, spms, ppms, or prms, you can live your life just as Cir has learned to do. MS is a disease that you have, but it's not the sum total of you. Over time you can learn to manage your MS. You can do the things you want to do by adapting the way you do them. It may be that you have to learn by trial and error, but it can be done. Want to learn a little more about MS? Go from Types of Multiple Sclerosis to Definition of MS.